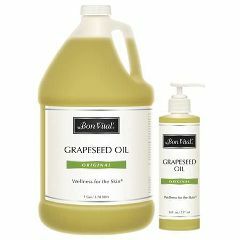 Bon Vital Grapeseed Oil provides a lightweight texture, smooth glide, easy absorption, and is known to be very gentle on skin. Contains a nice balance of oleic, linoleic, palmitic and stearic fatty acids. Excellent skin toner. Naturally rich in vitamins and minerals. Great for blending with your favorite essential oils. Available in 8 oz and 1 gallon sizes.